Chinese acquisitions of U.S. companies dropped 56 percent in volume to $44.5 billion, dragged down by concerns about U.S. national-security deal reviews and shifts in China’s foreign investment policies. The drop in Chinese-U.S. deal value to its lowest level since 2013 comes as overall cross-border acquisitions surged to $2.17 trillion, the highest total in nine years, Bloomberg Law data shows. Deal lawyers attribute much of the slowdown to China’s tightened control on money leaving the country, but say U.S. scrutiny of China-based acquisitions has given some companies cause for hesitation. “It does create caution in many people’s minds when Chinese buyers are involved,” Linda Ji, a partner in the Boston office of McDermott Will & Emery, told Bloomberg Law. 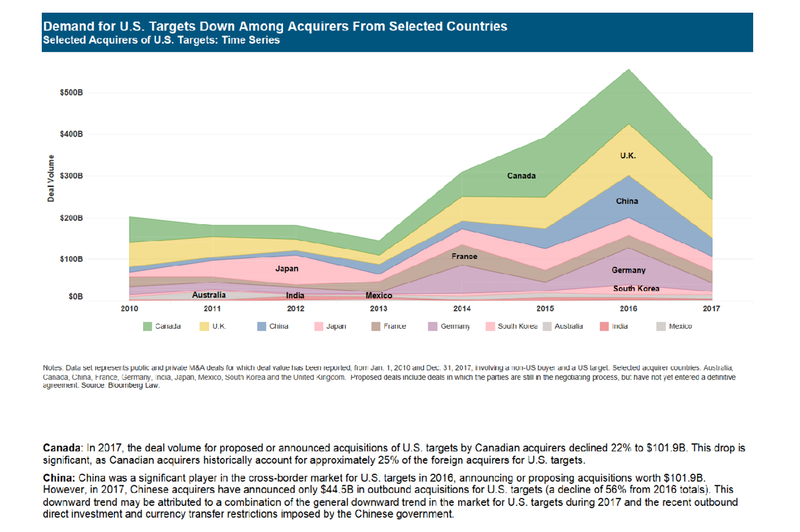 And while deal attorneys are optimistic that Chinese outbound investment will increase this year, there’s no consensus about how that will impact deals involving U.S. targets. China has taken several steps since 2016 to curb the flow of investments in companies abroad, effectively slowing the pace of foreign acquisitions by its domestic companies. China “was very much afraid of [a ton of] capital leaving the country,” said Liang Xu, a Beijing-based partner at Hogan Lovells who advises clients on cross-border deals. At that time, cross-border deals were taking a toll on China’s foreign reserve, prompting it to reconsider its investment policies. “They were concerned that an increase in transactions provided a legal channel for money to leave the country in the form of doing deals in the United States” and other nations, Xu said. Among other steps, China restricted domestic companies from buying foreign firms with a higher valuation than their own. The country last year also implemented a three-tiered system to control outbound foreign acquisitions. It restricted investments in industries including real estate and entertainment, and encouraged acquisitions related to infrastructure or advanced manufacturing. A third category prohibited investments in casinos and other gambling-related businesses. The collective body of new foreign investment policies has “severely impacted the amount of transactions that Chinese buyers would be able to close,” Xu said. President Donald Trump’s decision in September to block a Chinese-backed investor from buying U.S.-based Lattice Semiconductor Corp. added another layer of uncertainty. Trump relied on a recommendation from the Committee on Foreign Investment in the United States, or CFIUS, which evaluates deals that may have national security concerns. The panel is chaired by the Treasury Secretary and has voting members from several government agencies, including the Defense and Justice Departments. Concerns about the potential to clear CFIUS review recently derailed the sale of Moneygram International Inc. to Ant Financial—a Chinese company owned by Chinese billionaire Jack Ma. CFIUS can take steps to unwind deals when the companies involved don’t submit the transactions for review, which attorneys interviewed by Bloomberg Law say has caused more companies to proactively file with the panel. Only four CFIUS-reviewed deals have ever been blocked by U.S. presidents, all of which involved a Chinese company or investor. “Buyers have become more cautious,” McDermott Will & Emery’s Ji told Bloomberg Law. “Even in cases where parties don’t think the deal has any impact on U.S. national security, but the deal size is relatively large,” potential buyers have been more cautious, she said. According to Ji, the work of cross-border deal attorneys has mostly stayed the same in the current climate. The most notable change during the past few years, she says, is simply CFIUS’ elevated profile. Congress currently is debating two bills (H.R. 4311 and S. 2098) that would expand the scope of CFIUS’ review process to include more deals. CFIUS is not, in most cases, an “absolute deterrent” for Chinese companies, although a lengthy review does add to the cost of a deal, Ji said. Both Ji and Xu say more clarity surrounding the Chinese currency transfer restrictions will spur an uptick in outbound acquisitions coming from China this year. Ji, holding a more optimistic view, said a potential increase in outbound Chinese investment means more deals could head to the U.S. These transactions, though, will still need to fit the criteria imposed by the Chinese government, she said.